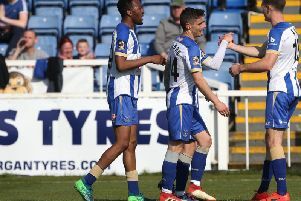 Craig Harrison hopes fans will turn out in their droves to support Hartlepool United’s young stars on their big night. Pools host Steven Gerrard’s Liverpool this evening in the third round of the FA Youth Cup at Victoria Park (kick-off 7pm). It is a huge assignment, given the Reds are dazzling the continent as well as this country after topping Group E of the Europe Youth League. But Harrison says the gifted Pools side have already shown great maturity and focus by setting up this tie at the Vic. Ian McGuckin’s team knew the reward for victory in the second round at Carlisle United but showed nerve and skill to get the job done at Brunton Park. “They did really well last round to win at Carlisle,” said Harrison. “And to win with the pressure on them of the prospect of facing Liverpool, what more can you want? “Even a Championship club facing Liverpool or Man United, you would be looking forward to it and these lads here are at a Conference club, who are massively devastated at relegation from the Football League. “Now they have the chance to test themselves against the best players in Europe at that age group. “I went into the dressing room at Carlisle afterwards and told them they deserved the chance to test themselves against Liverpool. “But now it’s not about turning up and being in awe of Liverpool, it’s about development and showing how good you are. “It’s fantastic for the club and the staff, Ian McGuckin, John Hewitson and Antony Sweeney have done a great job with the players. “They have played four games to get to this stage – this is their reward and we hope there will be a big crowd. Admission tonight is £5 (adults) and £3 (concessions).